Buy SEnuke XCr Lite - Get 8k Free CAPTCHAs! 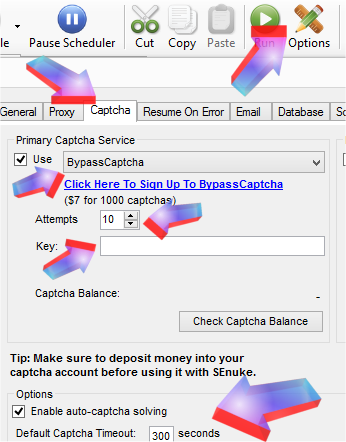 Start SEnuke XCr (Lite) and use "Options" => Tab "Captcha" => Primary Captcha Service "BypassCaptcha", set Attempts to 10, your 9kw.eu apikey is your "Key", select "Enable auto-captcha solving" and set Default Captcha Timeout to 300 seconds. Save it. Your "Key" is your 9kw.eu api key!